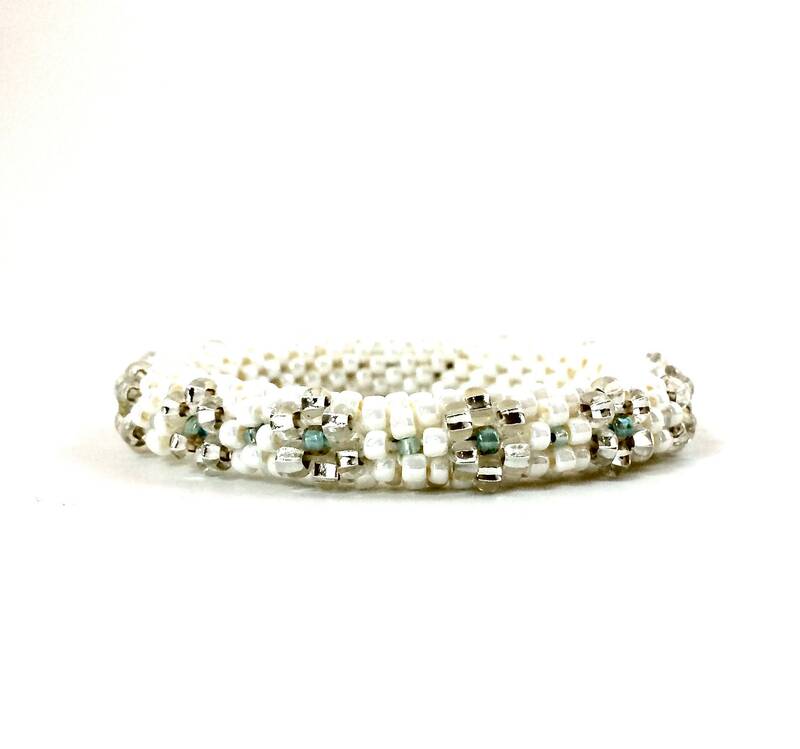 This is a flexible bead bangle crocheted with a background in creamy white. The flowers have tiny mint blue centers. The larger flowers have silver-lined crystal beads for petals. This 8" bangle will comfortably slide over most wrists. It is hand crocheted with sturdy but flexible nylon bead cord and is very comfortable to wear. Because of the nature of crochet, the bracelet will stretch to conform to your wrist size. Gorgeous necklace, and Sharon was truly a dream to work with. I'm sure this is the first of many purchases I'll make in this shop! I accept the payment methods listed above. I can reserve an item for you for up to 48 hours, but I do not offer layaways. Exchanges can be made for items returned within 14 days of receipt so long as the item is in its original condition and has not been used. Contact me if you wish to exchange an item. Shipping will be through the US postal service Priority Mail for knit and crocheted items. Jewelry is sent USPS First Class. I offer next day shipping for orders with confirmed payments that have cleared by the previous day. If payment for a transaction has not cleared within 3 days, the transaction will be cancelled and the item will be made available for sale in the shop. International shoppers, please be aware that you are responsible for all import fees, duties, VAT, GST/PST, taxes, etc. They are not included in my prices. Shipping times can greatly vary, anywhere from 2 to 6 weeks. Your business is greatly appreciated. I love making these handmade products and sincerely hope that you find as much joy in owning them. Although I may not have the production time to make custom items, your custom inquiry is always welcome. I do not sell "wholesale" but will give a discount to shop owners who have a valid resale certificate/business license and who make a minimum purchase greater than $500. Again, your inquiries are welcome.